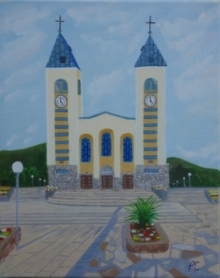 Medjugorje, 01. 08. - 06. 08. 2016. It was only few months ago that we had the 26th Youth Festival that gathered large number of the participants from all over the world. We are already preparing for the next on that will begin on August 1, 2016, not on July 31, 2016. The Youth Festival will finish on August 6, 2016. The organisers would like to inform all of the youth that due to the World Youth Day with Holy Father Francis in Poland, the next Youth Festival will exceptionally begin one day later. We expect you all, dear young people, to join us at the 27th Youth Festival in Medjugorje, they said. These prayer meetings were initiated by late Fr. Slavko Barbaric in 1990, when he gathered around 100 young people, two guitar players and the event was held in the green tent (located where the Hall of St. John Paul II is today). The number of the participants was increased each year and this is now the biggest event in Medjugorje. In the previous 2015 there have been 1 800 400 Holy Communions given in the church, and total of 38 870 priests that concelebrated at Holy Masses. Parishioners and thousands of pilgrims from all over the world were in Medjugorje for the celebration of New Year's Eve in prayer and in music. There were organised groups fro Germany, Austria, Slovenia, Ukraine, Korea, the United States, Czech Republic, France, Poland, Italy, Spain, Hungary and Slovakia. There were many young people from Croatia and Bosnia and Herzegovina. Fr.Dragan Ružić, with 42 priest concelebrating, was the main celebrant of the evening Holy Mass of Thanksgiving at 6 pm on December 31, 2015. That was opportunity to thank for all good that the Lord granted to this parish through the Queen of Peace. Fr. Dragan Bolčić led the prayer of Rosary at 5 pm, and the live nativity scene followed immediately after Holy Mass, performance given by the members of Cenacolo community. The prayer programme for the New Year's Eve started at 10 pm with vigil before the Blessed Sacrament, led by Fr. Stanko Ćosić. Fr. Vjeko Milićević was the main celebrant of the Midnight Holy Mass, with more than 80 priests concelebrating. The church of St. James, area around the church, White Dome and the Yellow Building were packed with many people who were joyfully praying and praising God. The whole programme was broadcast live on radio Mir Medjugorje. Late Fr. Slavko Barbarić was the one who initiated this celebration of New Year's Eve in this way, and ever since that time, the number of pilgrims who decide to be here on this special day, to have this celebration in a different way than ordinary, in prayer and in praising God. Many pilgrims, primarily the younger ones, are expected to arrive to Medjugorje for the celebration of the New 2016 Year. The evening prayer programme will begin on the New Year's Eve with the Rosary at 5 pm, and the evening Holy Mass of Thanksgiving will be celebrated at 6 pm, followed by the Cenacolo community performance of the live nativity scene outside the church. The prayer vigil before the Blessed Sacrament will begin at 10 pm, and the solemn Holy Mass will be at 1130 pm. The whole programme will be live streamed in the Hall of John Paul II, and there will be live broadcasting on the radio Mir Medjugorje as well. On Friday, January 1, 2016we celebrate the Feast of Mary Mother of God. Holy Masses in the church of St. James will be at 7,8,11 am and 6 pm, and in the local churches in Miletina, Vionica and Šurmanci at 11 am. The final live nativity performance will be held on that day after the evening Holy Mass, around 7 pm. On Sunday, December 27, the Christmas concert of Medjugorje parish was held in the Hall of John Paul II. This performance was given by community Cenacolo, parish choir "Queen of Peace ”, children's choir „Doves of Peace ”, tambourine orchestra „Misericordia” from Šurmananci, YouFra Međugorje as well as the young guitarists. The atmosphere of fellowship and joy continued on the platou of the old church where the Advent encounters took place and those events were the opportunity to collect the help for the poor in the parish and in the region. Cenacolo community in the last few years has been preparing the live nativity scene, something that attracts all parishioners and pilgrims who visit Medjugorje in this season of Christmas. The scenery is made of manger, inn, citizens of Betlehem, cattle, very authentic costumes and actors amateurs who play Holy Family, three magi and shepherds. The youth from Medjugorje is involved in this event too. This live performance can be seen on Christmas Eve, then on December 31 and January 1, 2016, all days after the evening Holy Mass at 6 p.m. On December 28, feast of Holy Family, Holy Mass will be at 3 p.m. for all children and their parents, followed by the live performance. May this Christmas be for you day of joy and peace. May Jesus visit you in your families and may he be born in the hidden place of your heart!